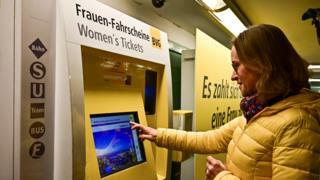 Berlin's public transport authority BVG is offering women a 21% discount on fares in the capital to mark Germany's Equal Pay Day. BVG says the aim is to draw attention to the average 21% pay gap between men and women in Germany - one of the biggest gender pay gaps in the EU. Explaining the women's "Frauenticket" scheme, only valid for Monday, BVG said the 21% gap was equivalent to 77 days of unpaid work for women. And 18 March - Equal Pay Day - is day 77 since the start of the year. The gender pay gap in finance and insurance is higher than in the business economy as a whole, the EU's statistics agency Eurostat reports. In general, the male-female pay gap tends to be much lower for younger employees - it widens with age.